Ibn Zuhr (Arabic: ابن زهر‎; 1094–1162), traditionally known by his Latinized name of Avenzoar, was an Arab physician, surgeon, and poet. He was born at Seville in medieval Andalusia (present-day Spain), was a contemporary of Averroes and Ibn Tufail, and was the most well-regarded physician of his era. He was particularly known for his emphasis on a more rational, empiric basis of medicine. His major work, Al-Taysīr fil-Mudāwāt wal-Tadbīr ("Book of Simplification Concerning Therapeutics and Diet"), was translated into Latin and Hebrew and was influential to the progress of surgery. He also improved surgical and medical knowledge by keying out several diseases and their treatments. Avenzoar was born in Seville in 1094, to the notable Banu Zuhr family who were members of the Arab tribe of Iyad. The family has since the early 10th century produced six consecutive generations of physicians, and included jurists, poets, viziers or courtiers, and midwives who served under rulers of Al-Andalus. Avenzoar started his education by studying religion and literature, as was the custom in medieval Muslim socialites. He later studied medicine with his father, Abu'l-Ala Zuhr (d.1131) at an early age. According to Avenzoar himself, his father introduced him to the works of Galen and Hippocrates, and asked him to swear the Hippocratic Oath while still a youth. Avenzoar started his medical career as court physician for the Almoravid empire. However, for some undisclosed reason, he later fell out of favour with the Almoravid ruler, 'Ali bin Yusuf bin Tashufin, and fled from Seville. He was however, apprehended and jailed in Marrakesh in 1140. This experience left a bad resentment in him as alluded from his writing. Later in 1147 when the Almohad empire conquered Seville, he returned and devoted himself to medical practice. He died in Seville in 1162. "The book of moderation," this was a treatise on general therapy written in his youth for the Almoravid prince Ibrahim Yusuf ibn Tashfin. The book is a summary of various different diseases, therapeutics and general hygiene. It is also noted for its advice regarding cosmetics and physical beauty. Ibn Zuhr even recommended plastic surgery to alter acquired features such as big noses, thick lips or crooked teeth. The book of foods, as its name indicates, is a manual on foods and regimen which contains guidelines for a healthy life. Ibn Zuhr wrote the book shortly after he went out of jail for his new patron, Almohad leader Abd al-Mu'min. The book contains classification of different kinds of dishes and foods like bread, meat, beverages, fruits and sweets. When he talks about the meat, Ibn Zuhr mentions different kinds of animals' fleshes, even unusual ones like those of gazelles, lions and snakes, classifying them based on their taste, usefulness and digestibility. He also recommends specific foods for each season of the year. For example, during winter, digestion is accelerated, so the amount of food consumed should also be increased. Moreover, the food should also be warmer and drier, as temperatures are lower and humidity is higher. 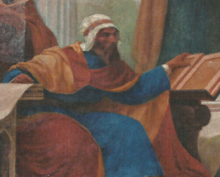 The Jewish physician-philosopher Maimonides admired Ibn Zuhr, describing him as "unique in his age and one of the great sages". He frequently quoted him in his medical texts. Averroes praised him as the greatest physician since Galen. Both his daughter and granddaughter also became physicians, specializing in obstetrics. ^ Arvide Cambra, L.M. (2015), "Abu l-'Ala' Zuhr, The Quack of Al-Andalus", International Journal of Humanities, Social Sciences and Education (IJHSSE), vol. 2, no. 10, pp. 99-102. One or more of the preceding sentences incorporates text from a publication now in the public domain: Chisholm, Hugh, ed. (1911). "Avenzoar" . Encyclopædia Britannica. 3 (11th ed.). Cambridge University Press. p. 54. ^ Tweel, Jan G.; Taylor, Clive R. (25 May 2010). "A brief history of pathology". Virchows Archiv. 457 (1): 3–10. doi:10.1007/s00428-010-0934-4. PMC 2895866. PMID 20499087. ^ "2 Early concepts of cancer", 2000, Cancer and metastasis reviews, vol. 19, no. 3, pp. 205-205. ^ Hajar, Rachel (1 January 2011). "Animal testing and medicine". Heart Views. 12 (1): 42. doi:10.4103/1995-705X.81548. PMC 3123518. PMID 21731811. ^ "Ibn Zuhr and the Progress of Surgery | Muslim Heritage". muslimheritage.com. ^ Kraemer, Joel L. (2010). Maimonides: The Life and World of One of Civilization's Greatest Minds. Random House of Canada. p. 91. ISBN 0385512007. ^ "Ibn Zuhr and the Progress of Surgery | Muslim Heritage". muslimheritage.com. Retrieved 2017-03-15. Millán, Cristina Álvarez (2005). "Ibn Zuhr". In Glick, Thomas F.; Livesey, Steven John; Wallis, Faith (eds.). Medieval Science, Technology, and Medicine: An Encyclopedia. Routledge encyclopedias of the Middle Ages; v. 11. New York: Routledge. ISBN 0415969301. Hamarneh, Sami (2008) [1970-80]. "Ibn Zuhr, Abū Marwān ʿAbd Al-Malik Ibn Abiʿl-ʿAlāʿ (Latin, Abhomjeron or Avenzoar)". Complete Dictionary of Scientific Biography. Encyclopedia.com.